Contents: Soup, rice (with sorted delcious bits), vegetables and milk. Notes: Anyone able to identify everything? Man that is healthy, and I bet it is dirt cheap as well. Top left looks like a typical salad of cucumber, cabbage, carrot, beans and maybe almond slices. Probably has a French or Italian dressing mixed in. Top right is a broth with spinach or similar green vegetable with eggs and corn. 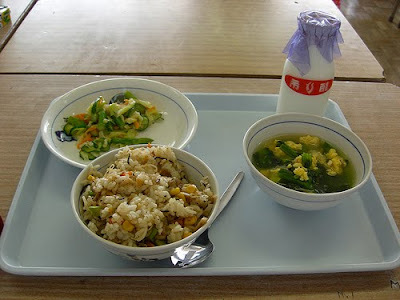 Middle is a dish of white rice mixed with vegetables and probably tiny dried fish. Looks like some corn in the rice as well. I'll bet there's bonito in the rice. Or at least the soup. Anon #3, it's probably about $2.50. I'm really sick of the "Everything in Japan is sooooo expensive!" meme. It's just not true. I miss Japanese school lunch!